Do you have a horse or pony? When I was growing up, my family had lots of them and it was important to keep my horse or pony happy. How can you do that? Similar to people,horses have their own personalities, likes and dislikes so it’s essential to find what your horse likes to do and let him use that skill. For example, if you have a pony who doesn’t enjoy jumping, but loves beginner riders, be sure he as plenty of beginners to ride him. We had a pony named Cocoa. She was sweet and sturdy. She could jump, but it really wasn’t her favorite thing. She loved taking care of small children during their lessons. We let her specialize in watching over the little ones and she lived happily for about thirty years. She joyfully trotted around for the small children and they adored her. What if your pony gets bored with being used for lessons in the ring? Take him on trail rides, or ride him the the fields to make him happy. If you do this, you’ll find he behaves much better in the riding ring. My favorite horse of all time was Peach. My dad looked all across the country for exactly the right horse for me to show. Peach was beautiful, sweet and almost completely black, except for the small white pattern on her hind legs. It took time for us to develop a bond,but she was amazing. The thing she loved most was jumping. When other horses would be so tired they dragged around the course, she’d be sprinting around, eagerly anticipating the next jump. Sometimes my sisters and I shared Peach in the same show so she might have six or seven jumping classes in one day. She thrived on those busy days. One particular day in New York, Peach and my sister Terri,won all of their classes, while Peach and I won all of ours. She was extraordinary. How did we know Peach had fun jumping? She’d crow hop (little bucks) when we finished the course. She’d shake her head while we patted her. Peach always knew when she did well and she was proud. She had another cute habit we loved. She’s flap her lips, both when we got ribbons and when we were for the shows the day before. We are so blessed to have owned her. 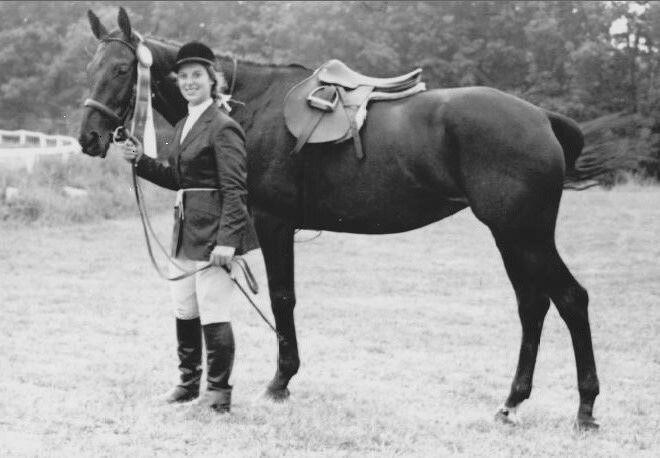 By the way, she was bred to become a racehorse, but never raced because it was determined running fast was not her talent. In closing, I’d say have fun with your horse or pony. Relax together, play together and find things to do that your horse or pony loves. If you make him happy, he’ll work hard to please you.